Sometimes people have to hit rock bottom before they allow themselves to open up to a hard self examination of their behavior and beliefs. That's what happened to Jay G.M. 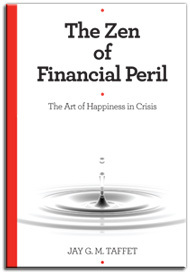 Taffet, and his journey inspired him to write about it in "The Zen of Financial Peril: The Art of Happiness in Crisis". When this book first came across my desk, I really didn't know what to expect. Was it about finance? Zen? Zen and Finance? I had no idea. According to Taffet, "The Zen of Financial Peril" is a motivational guide whose goal is to demystify spirituality and put it into a more practical context. This is done primarily by encouraging the reader to change the perspective they have on their life by learning how to distinguish between decisions made by the mind and by the soul. For most people who read and write about spiritual issues, this theme may not seem to be a new one. But for someone who is not familiar with this concept, when the discovery is made it can be quite overwhelming. Taffet writes his book in bullet style. Every phrase and thought he presents is a theme in and unto itself. There were times I wished he would have expanded his thoughts and explanations a bit. Also, this is not really a book about Zen and business or finance. The title stems from Taffet having made his discovery while he was at the brink of financial peril and his ability to achieve happiness by changing his outlook and choices. I have no doubt that many readers will find "The Zen of Financial Peril" a very helpful, motivational tool that they can use to improve their lives. It is a very readable, pratical book and quite absorbing once you start it. If you are stuck in the funk of winter and need to gain a new perspective about yourself or your business, this book will definitely activate your thinking and help you gain new insights about what you are doing and why you may be doing them. You can find out more about Jay G.M. Taffet by visiting his website.